Hey guys! I am back with another article. I just felt like writing something here today. Sorry in advance that the photos turned out unsharp and grainy but I must have gotten the camera settings wrong (not that I am ever good at setting them anyway). Plus it was getting dark so quickly when we shot these photos last week but I wanted to capture this lovely outfit I wore. But of course we, or actually just I, got distracted! This cute little white cat came up to me out of nowhere. 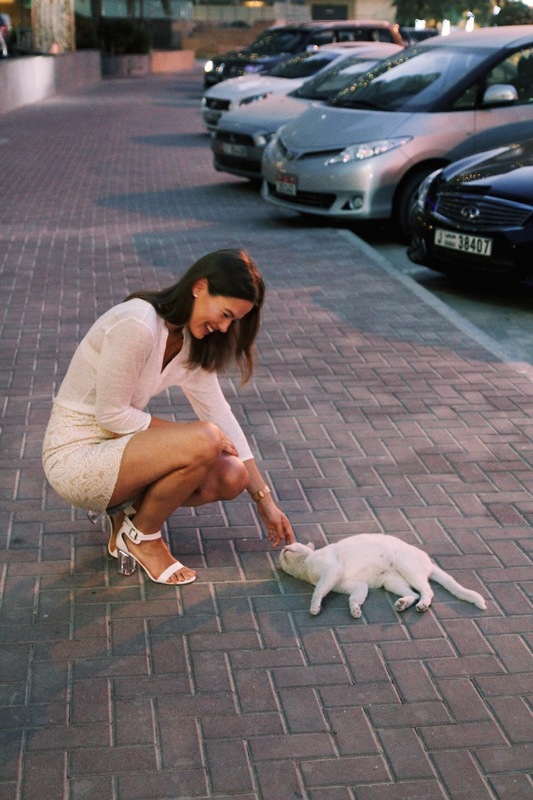 There are quite a lot of stray cats in Dubai but I can never say no, I always wanna pet them and play with them. This one was so friendly, I wanted to take her home. Sorry that I am rambling as a crazy cat lady, but my love for cats is just too strong haha. Anyway, back to the outfit. I have been really loving this skirt from Missguided, it was one of my favorite pieces this summer. And knowing that I am not a skirt kinda girl it says a lot. I've been wearing it during the summer quite often. What do you think about this outfit for warm evenings? Hey Meriem! :) Oh thank you so much. I think they are far from good but I am always trying my best. I use Canon 60D with a Tamron 17-50 lens. But I am thinking of selling this one and getting a smaller camera, as it is way more convenient now that I am traveling a lot.